Welcome to Craft Wondrous Item, where the Know Direction Crew show you all of the neat things that they’ve been crafting! 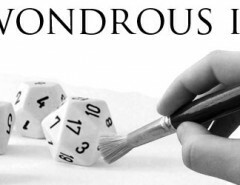 Today, Private Sanctuary Podcast’s cohost, Guidance’s author, and self-stylized Everyman Gamer Alex Augunas is going to be showing you the magic behind miniature modeling company, Imagine 3D Miniatures! I’ve really enjoyed spotlighting other creators in these segments, but today I’m doing something a little bit different. 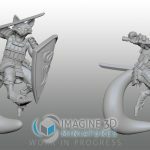 Instead of spotlighting a fan, I’m spotlighting a Spanish company called Imagine 3D Miniatures. 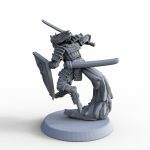 I discovered this company by accident while searching for the State-side company, HeroForge. 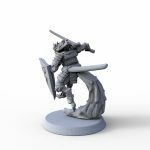 Like HeroForge, Imagine 3D Miniatures has a “pick-a-part” system where you can build your own miniatures from prepare parts, but that’s not what I’m going to talk about today. Imagine 3D Miniatures employs full-time digital sculptors, and a result they offer a service that HeroForge either cannot or does not—custom 3D Miniatures. 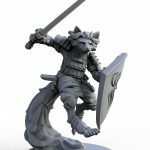 Now, I love a good vanity as much as the next guy, so I used one of my checks from Paizo for writing a Pathfinder Player Companion to splurge a little on myself by ordering a custom 3D miniature of my all-time favorite kitsune, Kyr’shin Yilenzo. 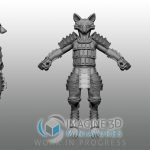 Today, I’m going to be sharing that process with you today in the hopes that you’ll be able to decide for yourself whether getting a 3D miniature sculpted is right for you! Now, because I mostly use my characters for Everyman Gaming’s artwork, I have TONS of images of Kyr’shin, so giving Maria a precise rendition of my character was easy. 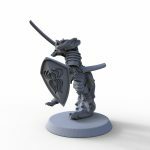 If you want but don’t have that sort of representation, Imagine 3D Miniatures does offer a character illustrating service. Whether you use that is your decision; I think you could probably get the picture done a lot cheaper by someone like Jacob Blackmon, or you could just find a lot more references that you really like. Please follow this link to what I call my company’s “Art Style Guide.” I’ve specifically picked a character who has a ton of art that you can use; I picked some of the best pieces I had to give you as much of a 360 degree view illustration-wise as I could. Pose: I’d like something really dynamic for the piece; shield and sword out, looking like he’s moving in for a fight. In my head, I’m picturing something acrobatic, like Kyr’shin is jumping backwards. Maybe his tail is “connecting him” to the base rather than his feet or something. 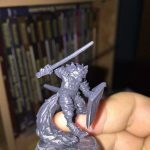 Miniature Size: I’m pretty sure that the tabletop RPG standard for miniature size is 28mm, correct? That’s the size I’m looking for: ideally I’d be able to put the miniature down next to something Reaper made and it would look to be at the proper scale. This is the “default” Kyr’shin appearance and includes the best look at his armor. I chose this image to have a good representation of Kyr’shin’s weapons. I picked this picture because it is a good reference for Kyr’shin’s bodily frame. This image, by Jeff Strand, was the most “traditional” piece of art I had for Kyr’shin. 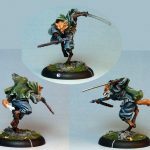 This is a miniature by Bushido, which Perram pointed out to me at GenCon 2015. The link that I mention was to my official “Everyman Gaming Artist Description” for Kyr’shin. Basically, whenever I make a character who will be illustrated for Everyman Gaming, I create a “style guide” for that character that uses a template. This is what I sent to David and Maria, which is taken from Kyr’shin’s style guide file. 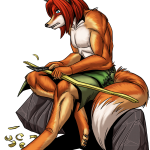 Kyr’shin is an adult forest kitsune with a taller, stocky build than the average kitsune (5’ 11” and 175 pounds). 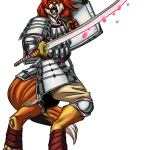 He has shoulder-length red hair, brilliant blue eyes, and primarily red-orange fur. The fur on the front of his torso and groin, the inside of his legs, the front of his neck, under his jaw, and the tip of his tail is white. In human form, Kyr’shin has fair skin with a strong jaw. Kyr’shin has a megaraptor animal companion named Tsume. Clothing-wise, Kyr’shin favors beige pants with leather footgear and gauntlets. 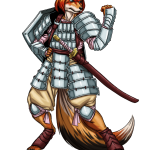 He wears a mithral do-maru breastplate and shoulder guards, along with mithral kiko-leggings and gauntlets. He carries a katana in his left hand and a shield in his right hand; the shield is decorated with a pink lotus and the katana has a golden pommel with two slits on either side of the blade (traditionally, this is to secure the blade to the wearer’s hip, though Kyr’shin keeps it in a sheath when it isn’t in use). 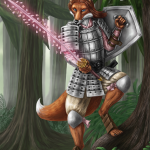 Kyr’shin’s favorite color is a pale shade of pink, and he wears a pink adventuring shirt under his armor at all times, and pink ribbons secure his mithral knee guards to his knees. Kyr’shin’s do-maru armor is strung on leather cords that are the same color as his footgear; these are unseen unless his armor has taken enough damage to destroy or remove one or more do-maru plates. 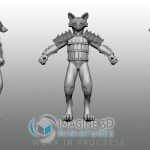 First we make the 3D sculpting of the model in a T position and we send you a render image of it, if you are happy with the result we proceed to the next step and if not you can make suggest changes to the model. The second part is the posing of the miniature, first we pose the miniature as suggested and we send you a render image of the result. As above you can suggest changes until you are happy with the result. The third part is the 3d printing in the material you want, currently we have three different materials, but we recommend the high definition acrylate. Here you have a picture of this material. And finally we send you the printed miniature and an .OBJ file so you can print the miniature all the times you want on your own 3D printer. 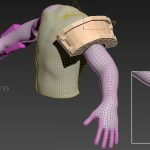 6/6 – A strip of Kyr’shin’s armor, modeled on a mock torso. 6/6 Rough Kyr’shin. Lacks much detail or tail. 6/6 Kyr’shin’s legs looked off to me, so I took another reference picture to show David why the model’s digitigrade legs looked off. 6/8 This arrived in my mailbox two days later. 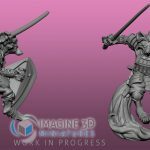 The feet were SIGNIFICANTLY better; I was thrilled to see that Imagine 3D Miniatures took my feedback seriously. One thing that I didn’t like from this model was that the feet only had four toes each. David said that it would be tough to do, but he’d try to give Kyr’shin five toes per foot on the next update. 6/14 I also got a weapon and shield update. 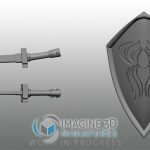 They even modeled a sheath for Kyr’shin’s blade. That, and the little handle on the shield, really impressed me. 6/14 One thing that I decided that I wanted on the bottom of the jumping miniature’s feet were little foot pads, so I gave David this reference picture and a brief description of what I wanted. 6/16 This is what I got for the “final” sculpt for Kyr’shin. I absolutely LOVED it, but the tail bothered me a little bit. I asked David to try and clean up the way the fur flowed in the miniature. 6/20 This was the final rendition for Kyr’shin’s mini after the edits I asked for on the tail. Absolutely breathtaking! Me holding the printed Kyr’shin mini, fresh from the packaging. So, what did I ultimately think of the service? Its absolutely, 100% wonderful. Like, WOW. 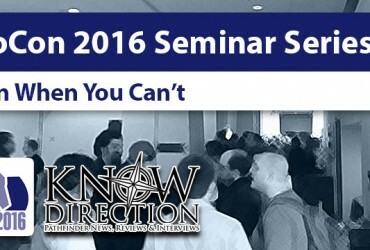 The level of quality and professionalism is astounding, and the work every bit worth waiting for. It is an expensive service, but the product you get is, in my opinion, totally worth it if you have a special character you want to immortalize. 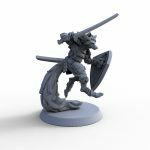 One thing I forgot to mention—Imagine 3D Miniatures also gives you the 3D printing file of your miniature to do what you want with, so you can actually order more copies if you want to. That, to me is awesome. 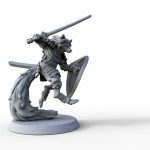 Even better—Imagine 3D Miniatures is going to have a storefront where creators can put their creations up for sale. And, you guessed it, Kyr’shin is 100% going to be for sale at their store when the service goes live. If he’s popular and Everyman Gaming can turn a profit on him, I’m looking into starting a small custom miniature line of Everyman Gaming’s iconic characters at Imagine 3D Miniatures, but even without the business prospects I found this service 100% worth my time and money. If this seems like your type of buy, I’d wholly recommend the investment. Its a lot of fun and watching artists of this caliber at work is incredible. Has the mini been painted yet? Yessir! It was professionally painted by Shoshie Bauer. You can see a picture of Shoshie’s finished paint job here: (http://www.everymangaming.com/kyrshin-mini).